Last year, Samsung announced that it will be commencing mass production of their HBM DRAMs in early 2016. Today, along with advanced graphics, network systems and enterprise servers. Today, Samsung has officially commenced mass production of their first 4 GB HBM2 DRAMs which are going to target the HPC platforms for high-end graphics rendering and deep-learning capabilities. The first product designed in accordance with the High Bandwidth Memory specifications is a 4 GB DRAM that is designed with the latest 20nm technology, offering better efficiency over previous generation DRAM chips. The HBM2 memory chips designed by Samsung will be integrated on next generation HPC systems and graphics cards that are tasked to run parallel computing, graphics rendering and machine learning. The production of the latest HBM2 DRAMs also marks a milestone for Samsung in the TSV (Through Silicon Vias) technology that is a crucial component of the HBM DRAM design. The new HBM2 memory makes use of beefier 8Gb (Gigabit) dies which are connected and stacked vertically through the TSVs. Each package of these dies is able to deliver speeds of 256 GB/s (Gbps bandwidth) which is twice the bandwidth of current generation HBM1 memory that provides a 128 GB/s bandwidth and over 7x increase compared to a 4 Gb GDDR5 DRAM chip (36 Gbps). 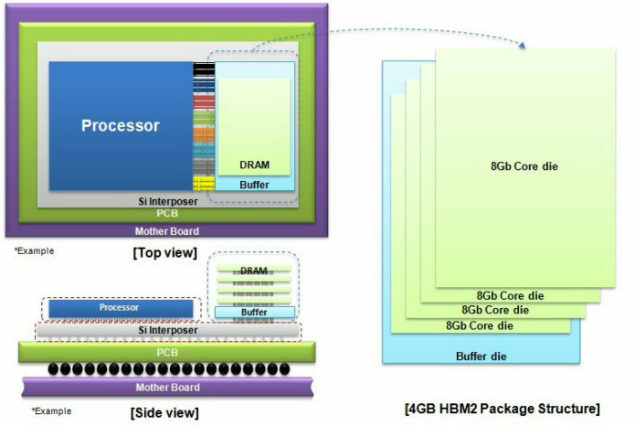 The 4 GB HBM2 package can be incorporated in several stacks, offering higher memory space at better efficiency than current generation DRAM solutions. Having either two of these packages on an interposer would get 8 GB of VRAM along with 512 GB/s of total bandwidth and four packages would mean 16 GB of VRAM and 1 TB/s bandwidth. In previous slides, Samsung demonstrated that users can achieve a list of various designs with 4 GB HBM2 DRAM that can include chips with up to 24 GB HBM2 DRAM clocking in at 1.5 TB/s bandwidth. As for even higher memory demands, Samsung did acknowledge that they are well on their way to producing 8 GB HBM2 DRAM packages within this year to allow space savings of more than 95 percent, compared to using GDDR5 DRAM, offering more optimal solutions for compact devices that require high-level graphics capabilities in the consumer and enterprise sectors. From the previous slides, we know that moving forward, Samsung will have a range of solutions packed in either 2-Hi, 4-Hi or 8-Hi stacks. The entry level models include the 2-Hi DRAM model that will be integrated on mainstream 2 GB HBM graphics cards (256 GB/s), performance based graphics with 4 GB HBM (512 GB/s). The Enthusiast graphics cards will ship with 4-Hi DRAM with 2 HBM stacks that will allow 8 GB VRAM (512 GB/s) and finally, 4 HBM Stacks with 16 GB VRAM models (1 TB/s). On the HPC front, there are a wide array of high bandwidth and dense memory designs that include 4-Hi DRAMs with 4 HBM stacks that feature 32 GB VRAM (1 TB/s) and the bulky, 8-Hi DRAMs configured in 6 HBM stacks with 24 GB and 48 GB VRAM, both models featuring 1.5 TB/s bandwidth. 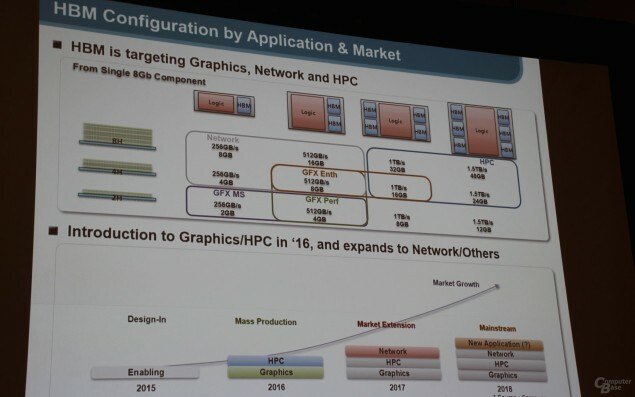 There are also some network oriented HBM SKUs which are planned for launch in 2017 with 8-Hi DRAM Stacks configured in 1-2 HBM chips. In 2018, Samsung wants to focus on increase market growth by entering new applications to incorporate their HBM designs. HBM2 is going to be the next generation DRAM standard to power upcoming iteration of graphics cards from AMD and NVIDIA. Codenamed Polaris and Pascal, the flagship GPUs of these families will be using over 1 TB/s HBM2 chips with VRAM of up to 32 GB. For more information on HBM2, you can read the official specification sheet of HBM2 published by JEDEC.